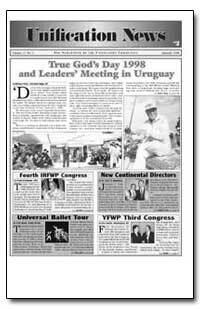 Family Federation for World Peace and Unification's publication Unification News is one of the best periodicals for discovering what is being done around the world to promote peace on earth. 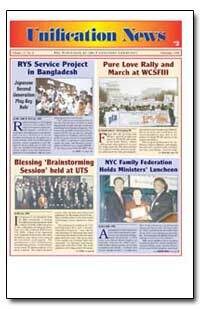 Select an issue from the most current to January 1993. 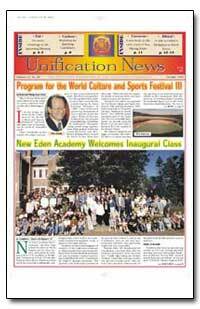 Unification News .PDF files are about 8 Megabytes -- they take a long time to download. Excerpt: This is not a complete or exact translation of this speech and prayer, and should be taken only as an outline to con - vey the spirit of the con - tent that was given. 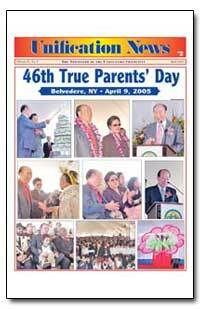 November 12, 2004 (October 1 by the lunar calendar) 8 AM: Five thousand members and leaders gathered at Cheong - Pyeong Heaven and Earth Training Center to celebrate the 45th True Children's Day (44th anniversary) with True Parents. The following is an outline of True Father's prayer and speech on that occasion. 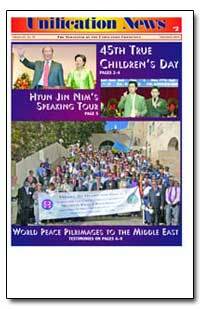 Excerpt: On May 1 2005, at Blue Sea Garden, Yeosu, around thirty-four thousand people, which includes Mongolian Federation leaders from around the world, representatives of the nations of the world, participated in a commemorative service for the 51st anniversary of the founding of HSA-UWC, which was held at Blue Sea Garden in Yeosu. 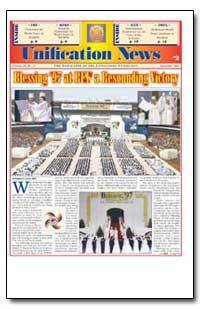 Excerpt: With a few countries and continents bestowing the Blessing upon large numbers of individuals and married couples, I considered seriously what we in America will do to open the gates. I anguished over this question primarily for our state, Kentucky. Finally the breakthrough arrived, and we are experiencing great hope. Excerpt: Almost 1,000 Washington VIPs, including senators, congressmen, ambassadors, city leaders, religious leaders and scholars, joined members of the staff of the Washington Times Corporation, as well as the 340 participants in the Western Literary Conference, at the Grand Hyatt Regency Hotel in Washington D.C. on the evening of June 16 to celebrate the 15th Anniversary of the Washington Times newspaper. 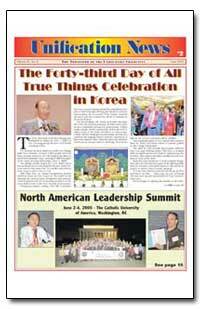 Excerpt: The day after arriving in Korea on July 21, True Mother began her successful series of rallies for leaders in sixteen cities throughout Korea, on the subject ?True Family Practices Leadership Rally Toward World Peace and Unification, Korea.? 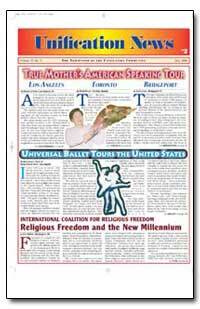 She furthermore held two successful rallies for women leaders. Excerpt: This is the text of the statement released to the media at a press conference held October 29 in Washington, DC. It is my honor to serve as the Chairman of the World Culture and Sports Festival III, which will take place here in Washington the week of November 23-30. 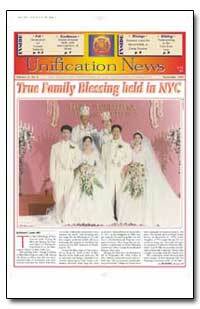 Excerpt: October 29, 1997, at noon Rev. Kwak held an international press conference a the national press club in Washington, DC, explaining the WCSF and the Blessing. 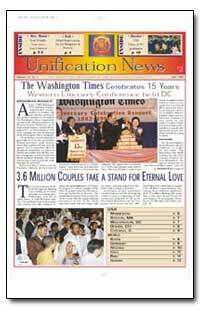 Excerpt: Who would have thought we would see the day that Father would declare, speaking in Korean through an interpreter, ?On this day of November 29, 1997, at RFK Stadium in Washington DC we are Blessing 3.6 million couples and 36 million couples together - 39.6 million couples are being Blessed in front of you.? Excerpt: Rural education in developing countries often suffers from a lack of concern and material support. Low levels of education and inadequate school facilities act as a hindrance to future healthy development. Bangladesh, a nation known more for its widespread poverty, dense population and disastrous floods than for its rich culture and warmhearted populace, currently suffers from the underdevelopment of its educational infrastructure throughout its countryside. 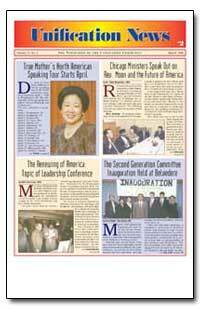 Excerpt: Dr. Hak Ja Han Moon will begin a 16 city speaking tour in the North American Continent beginning April 1, 1998 in Washington, DC. 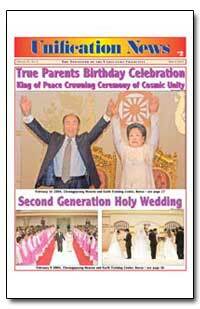 The official title of her speaking tour will be ?Blessed Marriage and Eternal Life.? 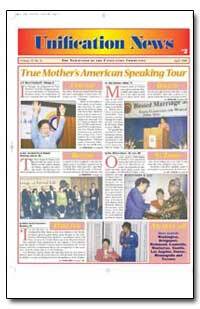 Excerpt: In Chicago we prepared for True Mother?s visit by bringing together our Committee of Department leaders under the leadership of our regional director Bishop Ki Hun Kim. 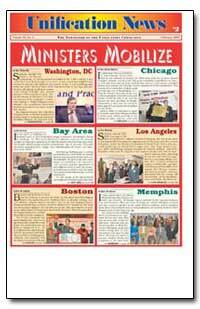 What has worked well through the past campaigns is our unity centering on the Christian Churches of Chicago. Excerpt: As we looked anxiously across the skies waiting for the plane to appear, it suddenly appeared out of a white puff of cloud hovering over Los Angeles airport (LAX). This was truly the most perfect day seen in Los Angeles in a long time. The previous day was the storm before the calm; and how appropriate on Easter Morning April 12, the weather cleared for True Mother?s Hoon Dok Hwe speech. 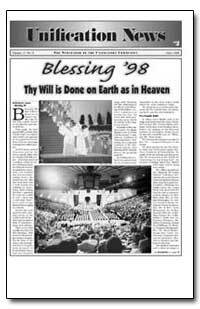 Excerpt: Blessing ?98 was held at Madison Square Garden June 13, and was a great victory on the physical and spiritual levels.